*Nico by FHANA Ster mare Anita ( Jaser X Peke) with 6 Ster, 5 Ster preferent, 1 Ster prestm., 4 preferent, 1 model preferent, and 1 model pref prestm. For a total of 18 predicates. Our desire is to produce world renowned best of the best pinto Friesian offspring. Beracah is a phenomenal stallion and dressage prospect that will satisfy all dreams and expectations of beauty, majesty and performance ability. Pictured at 2 days old Beracah declares his presence and is pretty sure he is a stallion! This is one macho handsome sweetie with a canter to die for! Presence galore...a definite competitive dressage companion! Incredible pedigree top and bottom. His dam was 1st premie and Champion filly at Keuring in Blauhuas Friesland. 3rd place out of 500 in Friesland at the central mare show. She and Nico seem to be a fantastic match! Congrats Kimo and Lynn! You are such a blessing, Jon and I are thrilled to have new Nico friends so close to home! 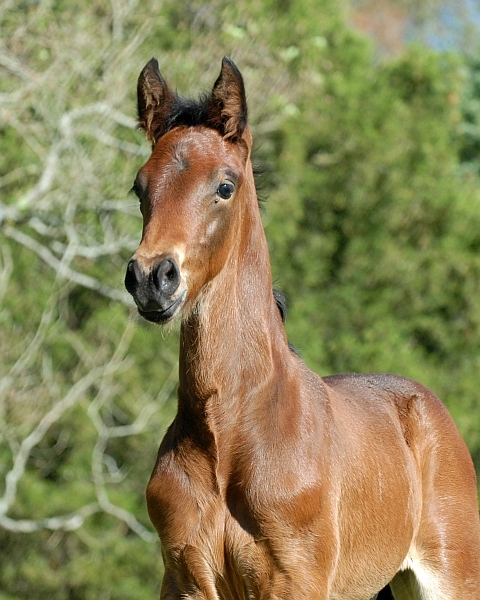 Pharaoh's dam (approved Hannoverian mare -Pablito X Diamont) was specifically purchased for this breeding last year ...she has faultless conformation and is absolutely fancy while phenomenally performance bred. This young man makes a statement. Built and bred to compete and win....and be noticed! He is scared of nothing....bold, expressive and one of the most intelligent foals I have ever known not to mention he can jump a fence the height of himself :( :) HMMMM....Comments from AHS judge included "very nice hip, excellent shoulder and a neck put on just right." 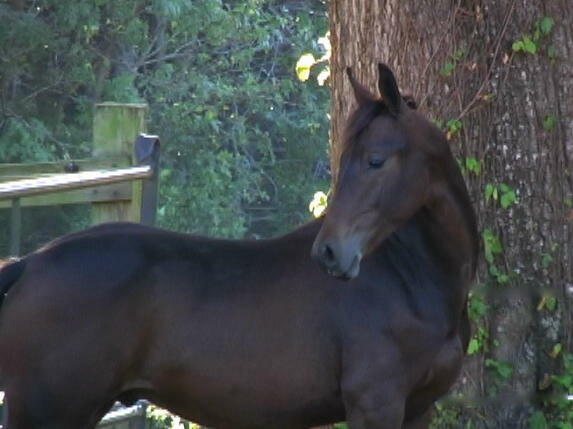 Pharaoh will be staying on our farm to be gently and correctly started under saddle and sold going 1st or 2nd level. This is an excellent prospect that we believe in. We are anxiously looking forward to his training and giving him a super start into his performance career! Registered KWPN. 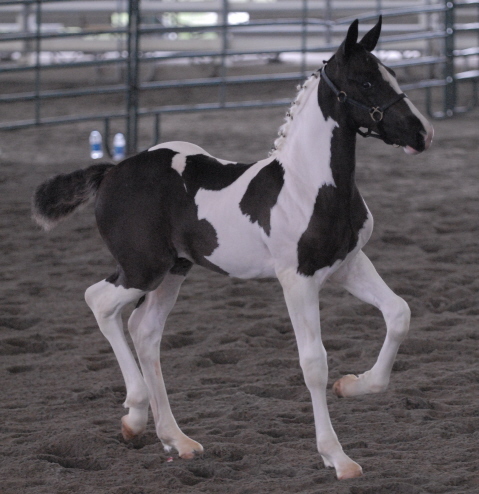 Sired by Imported Black and White Friesian Dutch Warmblood Stallion *Nico out of Imported Gribaldi X Olympic Ferro KWPN approved mare Vlarina. Words cannot describe the presence and appeal of Celestina. Her pedigree is full of world class performance bloodlines and dressage talent! This will be a fun forward moving super smashing filly. She is sweet and trainable with elastic and powerful gaits. She is elegant and feminine with a piaffe on the way to the water tank :) Pictured at 1 1/2 months old. to Jill in California en-route to Michigan to build her new barn and watch this fancy filly grow up. Jill plans on competing in dressage and adoring Celestina for many years to come! Thanks Jill. 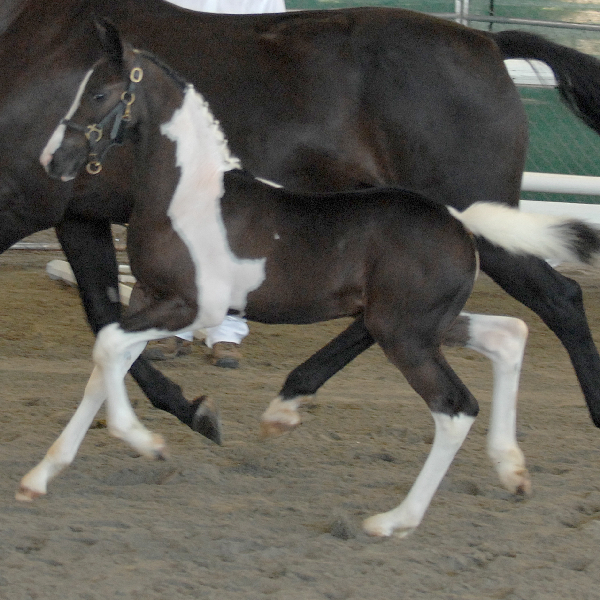 Every year our much adored and very proven mare Thekla throws the very same wonderful offspring. 4 colts in a row almost identical except for color. Full sibling to 2003 Elijah (scoring in the upper 70's his first show season and placing 4th in the USDF regional championships) , 2004 Ollie, and 2006 Joseph. Big bold movement with elegance and trainability. They turn out bombproof with upper level performance ability for dressage or eventing. The Nico X Thekla combination produces a very versatile competitive leggy prospect. Typical maturity height 16.3+ Lazarus was blessed with his mothers huge melt your heart eyes! Pictured at 2 weeks of age. God blessed our farm with a lovely and talented rider - an up and coming 'young rider'. Andrea came to visit the farm after falling in love with the handsome and talented Elijah. She decided to buy his brother to be her "young horse" competition partner ! She is now riding with us every day and looking forward to training Lazarus (now Motown) and winning some blue ribbons!!!! Go make us look good Andrea!